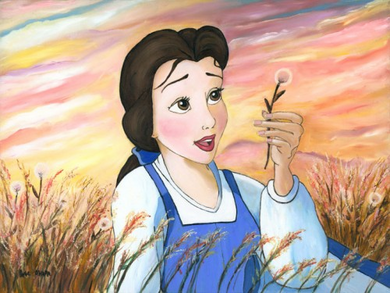 Paige O'Hara Signed and Numbered Giclée on Canvas: "Daydreams"
About The Artist: PAIGE O'HARA is widely known as Disney's heroine, Belle, in the critically acclaimed, Oscar-winning animated film Beauty and the Beast. In concert she has appeared in stagings of Sitting Pretty, The Cat and the Fiddle, Oh Boy, and Lady! Lady!, all at Carnegie Hall, as well as One Touch of Venus at Town Hall. She has toured Japan as a Special Guest Star with the Hollywood Bowl Orchestra and was the Special Guest Star/Host in The Great Radio City Music Hall Spectacular at the Flamingo Hilton . As a concert soloist, Paige has guest-starred at the Hollywood Bowl, the Boston Pops, and the Turrin Opera House. Paige's many recordings include Jerome Kern's Sitting Pretty, Mack and Mabel in Concert, recorded live in London, and a new and complete version of South Pacific .Two other recordings, Showboat and Of Thee] Sing, were nominated for a Grammy in the Best Show Album category. Paige's love of painting began when she was a child. Her father was an architect - so drawing and painting was very much a way of life. Although Paige found much success with her singing, painting was always her escape. Much of her time was spent studying and learning from the masters - Turner, Sargent, Da Vinci - and although she does not have formal training, her years of practice are evident. When she first moved to New York, she helped support herself by selling her works on the street. As her stage career flourished, she painted for herself. ?